Katherine Stewart’s chilling exposé of the well-funded, highly coordinated effort by Christian Nationalists to use public schools to advance a fundamentalist agenda. Published in January 2012. 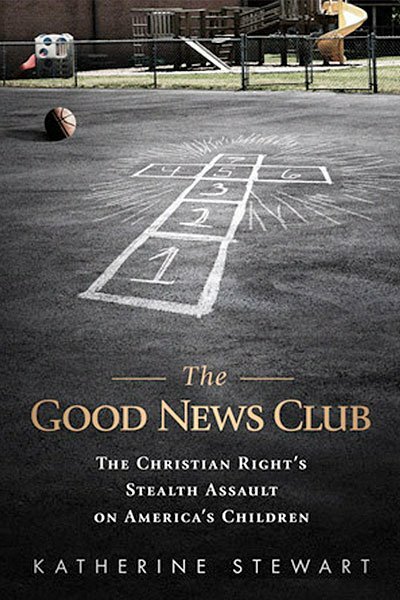 “Even those well-versed in the religious right’s attempt to Christianize American institutions will likely be shocked by The Good News Club. Katherine Stewart’s book about the fundamentalist assault on public education is lucid, alarming, and very important.” -MICHELLE GOLDBERG, author of Kingdom Coming: The Rise of Christian Nationalism. In 2009, the Good News Club came to the public elementary school where journalist Katherine Stewart sent her children. The Club, which is sponsored by the Child Evangelism Fellowship, bills itself as an after-school program of “Bible study.” But Stewart soon discovered that the Club’s real mission is to convert children to fundamentalist Christianity and encourage them to proselytize to their “unchurched” peers, all the while promoting the natural but false impression among the children that its activities are endorsed by the school. Astonished to discover that the U.S. Supreme Court has deemed this—and other forms of religious activity in public schools—legal, Stewart set off on an investigative journey to dozens of cities and towns across the nation to document the impact. In this book she demonstrates that there is more religion in America’s public schools today than there has been for the past 100 years. The movement driving this agenda is stealthy. It is aggressive. It has our children in its sights. And its ultimate aim is to destroy the system of public education as we know it.